Two radiographic views of the left knee were obtained and showed signiﬁcant soft tissue swelling of the anterior aspect of the knee. The images also revealed signiﬁcant degenerative changes of the knee joint, including widening of the intercondylar notch and joint space narrowing (Figures1 and 2). There are 2 major types of hemophilia: hemophilia A (classic hemophilia), which is a functional deﬁciency of Factor VIII of the intrinsic pathway of coagulation; and hemophilia B (Christmas disease), which is a functional deﬁciency of Factor IX of the extrinsic pathway of coagulation. The combined incidence of hemophilia A and B is 1 in 5000 live male births.1As both conditions exhibit X-linked recessive inheritance, they are observed almost exclusively in males. Hemophilic arthropathy can be characterized as acute, subacute, or chronic. 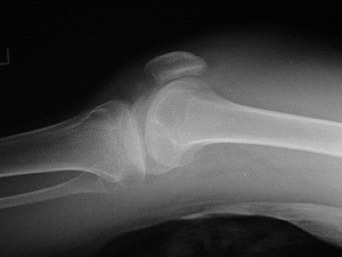 The acute and subacute patterns of joint involvement tend to resemble juvenile rheumatoid arthritis and septic arthritis, while chronic involvement resembles the degenerative changes of osteoarthritis.4 Clinically, acute ﬁndings include a tense, swollen, and reddened joint that is painful and stiff. Early pathologic changes can be characterized asdirect sequelae of hemarthrosis and include mild synovial proliferation, acute perivascular inﬂammation, and synovial accumulation of iron. Radiographic ﬁndings at this stage are generally limited to a dense joint effusion (hemarthrosis). Following an acute episode of hemarthrosis,the synovium must absorb the blood degradation products. After several acute episodes, marked synovial hypertrophy, inﬂammation, vascular hyperplasia, ﬁbrotic changes, and hemosiderin deposition can be observed. These pathologic ﬁndings suggest subacute hemophilic arthropathy. Radiographically, soft tissue swelling, periarticular osteoporosis, epiphyseal overgrowth, and a mild radiopacity of the synovium characterize this stage of disease. 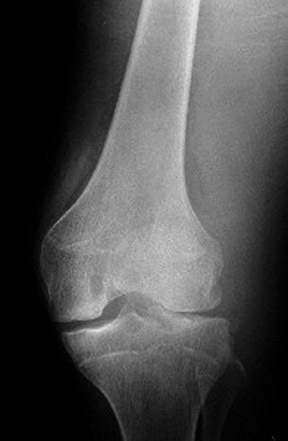 With magnetic resonance imaging, the synovial hypertrophy exhibits a very characteristic low signal intensity, a ﬁndingthat is especially prominent with gradient-echo sequences because of the magnetic susceptibility effect of hemosiderin deposition.5 Chronic involvement occurs over months to years and can manifest clinically as permanent joint deformity, decreased range of motion, and unequal extremity lengths. Pathologic changes at this stage are a consequence of altered joint mechanics and include cartilaginous denudation, osseous microtrauma, and osseous proliferation. The current standard of care consists of aggressive intravenous infusion with Factor VIII or Factor IX replacement. When used on a prophylactic basis, coagulation factor replacement therapy may prevent the joint destruction common among hemophiliacs. There is also some evidence that radionuclide synovectomy can help reduce hemarthrosis and prevent hemophilic arthropathy.6 However, because of the progressive and irreversible nature of large joint involvement, total joint replacement remains the only effective treatment for end-stage disease. Hemophilic arthropathy is a well-known manifestation of hemophilia. The diagnosis is generally made clinically and conﬁrmed with radiographic ﬁndings. While plain ﬁlms are adequate for diagnosis, the increased sensitivity of magnetic resonance imaging allows for early detection and accurate assessment of the extent of involvement. Hoots WK, Shapiro AD. Clinical manifestations and diagnosis of hemophilia. Available online at http://www.uptodate.com/patients/content/topic.do?topicKey=coagulat/11698. Resnick D. Bleeding disorders. In: Resnick D. Diagnosis of Bone and Joint Disorders, Vol. 3. 4th ed. Philadelphia, PA: WB Saunders Company; 2002:2346-2373. Avi&ntilde;a-Zubieta JA, Galindo-Rodriguez G, Lavalle C. Rheumatic manifestations of hematologic disorders. Curr Opin Rheumatol. 1998;10:86-90. Llauger J, Palmer J, Roson N, et al. Nonseptic monoarthritis: Imaging features with clinical and histopathologic correlation. RadioGraphics. 2000;20Spec No:S263-S278. Yulish BS, Lieberman JM, Strandjord SE, et al. Hemophilic arthropathy: Assessment with MR imaging. Radiology. 1987;164:759-762. Rodriguez-Merchan EC. Radionuclide synovectomy (radiosynoviorthesis) in hemophilia: A very efﬁcient and single procedure. Semin Thromb Hemost. 2003;29:97-100. Bleeding diathesis with hemophilic arthropathy. Appl Radiol.